Restoration works in the Pine Mountain area are underway as part of the Mid Brisbane Partnerships Program between Healthy Land and Water and Seqwater. Following the implementation of the program, private properties in Pine Mountain have been selected due to a range of challenges faced by landholders that affect the overall environmental condition of the catchment, and ultimately the health of the Brisbane River and Moreton Bay. 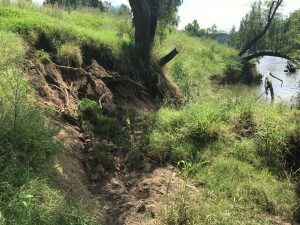 Project leaders and landholders have reported active gully head erosion, bank slumps, leaky weirs, minimal vegetation as the major concerns affecting water health in the Mid Brisbane catchment. The Pine Mountain Gully Restoration Project was launched in early 2018 and focuses on repairing eroding and low vegetated soil by stabilising the gullies. Through a series of stages over the next two years, the goals of restoring and protecting the Pine Mountain properties will be achieved through the installation of rock chutes and fencing, and the planting of ground cover species and plants along the gullies’ edges. 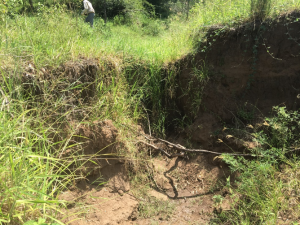 Working closely with the landholders, project leaders have started to implement the first stage of the project by installing the rock chutes in sections of the gullies that are most affected by fast flowing water. Rock chutes are vital structures when building resilience into these eroding valleys as they help to reduce the amount of water run off and prevent the displacement of soil. 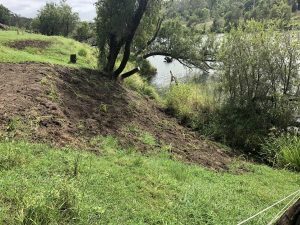 The next two stages of the project will involve fencing off the properties to ensure effective stock management and waterway protection and revegetating uncovered soil that will aim to improve riverbank health. The Mid Brisbane Partnerships Program was launched in 2017 to help restore and protect water quality and build resilience into the Mid Brisbane River catchment. A vital water source for residents and water utilities, the catchment provides local residents with drinking water, irrigation, recreation and amenity.